Just prior to World War II it was rare to see European race cars competing at the Indianapolis 500. Winners usually drove Millers or a derivative thereof, with engines from Studebaker, Duesenberg or Miller, later Offenhauser. There was one exception. 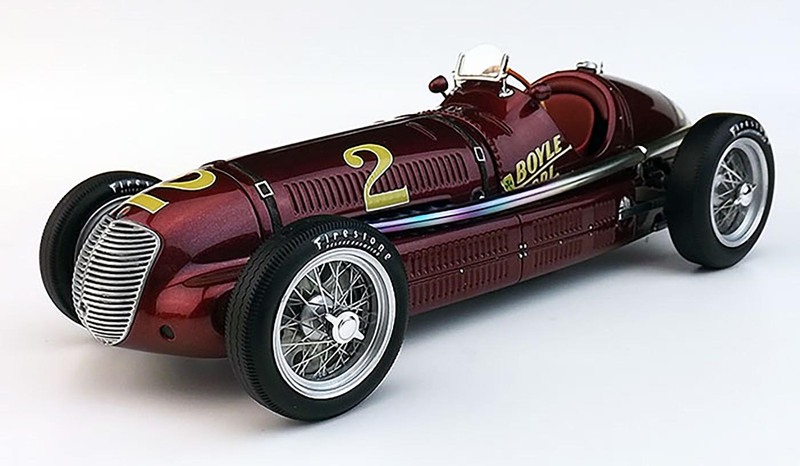 Mike Boyle’s team had deep pockets (think Roger Penske today), and connections, so in 1939 it landed an Italian racer for its successful Hoosier driver, Wilbur Shaw. Shaw already had won Indy in 1937, but hooked up with Boyle, who headed a large Chicago union. It was a visible sign that money bought the best drivers, and equipment. 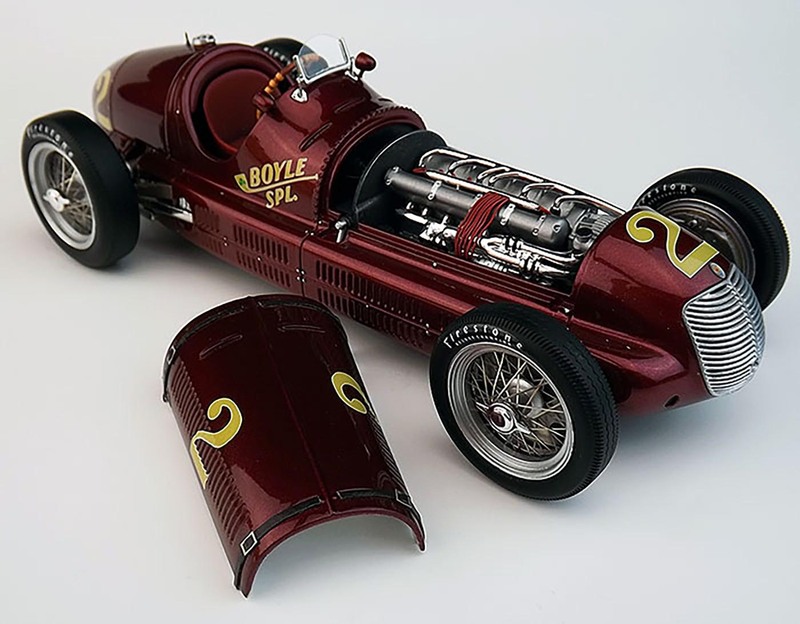 Replicarz now has created a gorgeous dark red, nearly maroon, Boyle Special, a Maserati 8CTF, to expand its Indy winning model lineup that includes both the larger 1/18 scale like this one, and 1/43 scale racers for those of us with limited display space. The 1926 Indy 500-winning Miller. Back before hearing the word “Miller” made us think of beer, the name meant winning at the Indianapolis 500, and elsewhere on the nation’s numerous board tracks. That’s right, they used to make race track surfaces out of wood! Millers were simple yet sleek racers that the best drivers, or their sponsors, bought to race at the highest levels throughout North America. 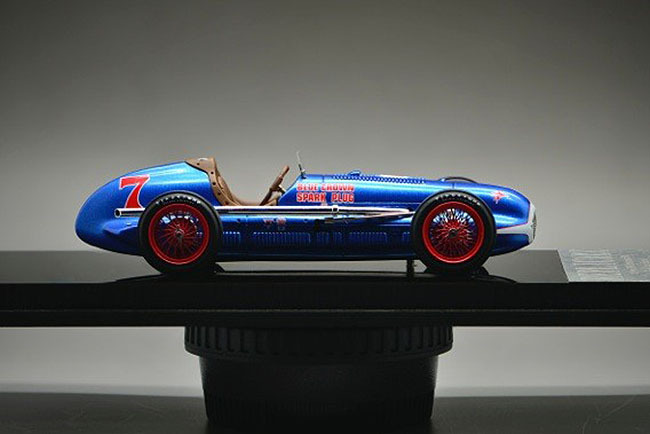 Indy was, and is, the crown jewel, and Miller racers were the cars to beat in the 1920s and early 1930s. 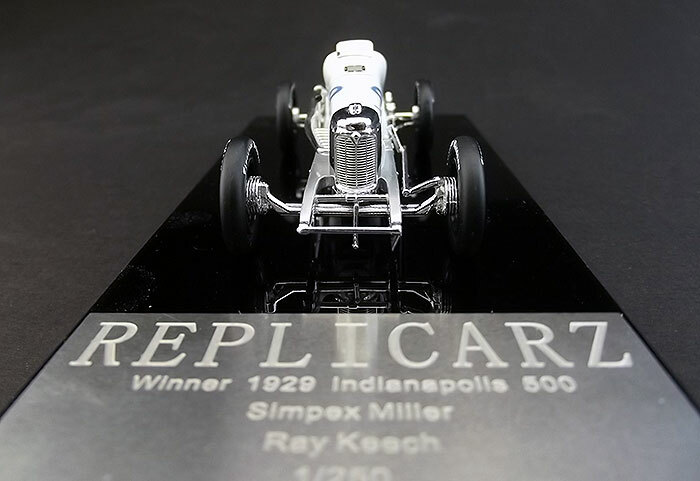 Now, Replicarz has produced two Indy 500 winners in 1:43 scale and in the limited quantities of just 250 each. Due to be released shortly are the 1926 Miller Special driven by Frank Lockhart, and the 1929 Simplex Miller driven to victory by Ray Keech. 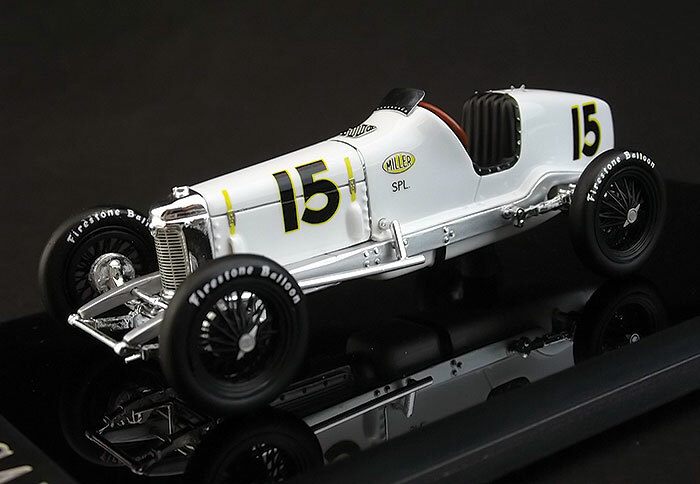 Replicarz’s earlier gold Miller driven by three-time winner Louis Meyer, sold out. So snagging one of these early probably would be wise, as only 250 of each are to be made. The 1929 Indianapolis 500-winning Miller. Harry Miller was a noted engine maker and race car designer. Cars he designed won the Indy 500 nine times and three more times cars that were using his engines won the race. I’d say “think Roger Penske” as far as success, but Penske never designed cars or engines himself. Millers, which were front-wheel-drive, were so dominant that they made up 83% of the Indianapolis fields from 1923 through 1928. Miller’s won 73 of 92 major U.S. auto races from 1922-29 and in 1929, 27 of the 33 racers in the Indy 500 were Millers. Bill Holland’s 1949 Indy 500 winner, the same basic car as Rose drove the two previous years, but in a brighter blue. Before there were A.J. Watson or Frank Kurtis roadsters to dominate the Indianapolis 500 there were Lou Moore’s Blue Crown Spark Plug Specials. These were blue (naturally) cigar-shaped front-wheel-drive, front-engine racers that, like Team Penske or Team Ganassi’s sleek cars today, were perfectly prepared and driven by some of the best hot shoes of the day. The result: three straight Indy 500 wins from 1947-‘49. The beneficiaries of these superb race cars were Mauri Rose and Bill Holland, top-flight drivers of the day. 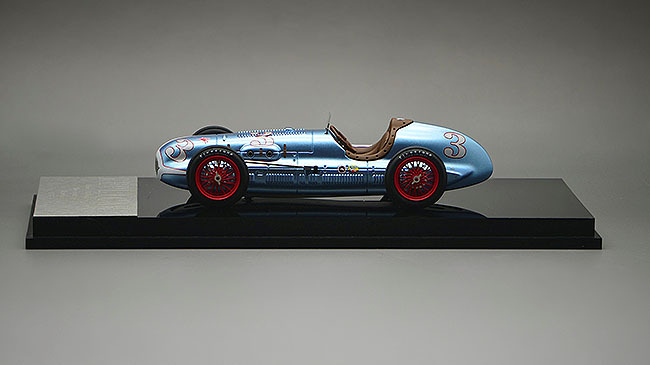 Mauri Rose’s 1948 Indy 500-winning Blue Crown Spark Plug Special, No. 3. 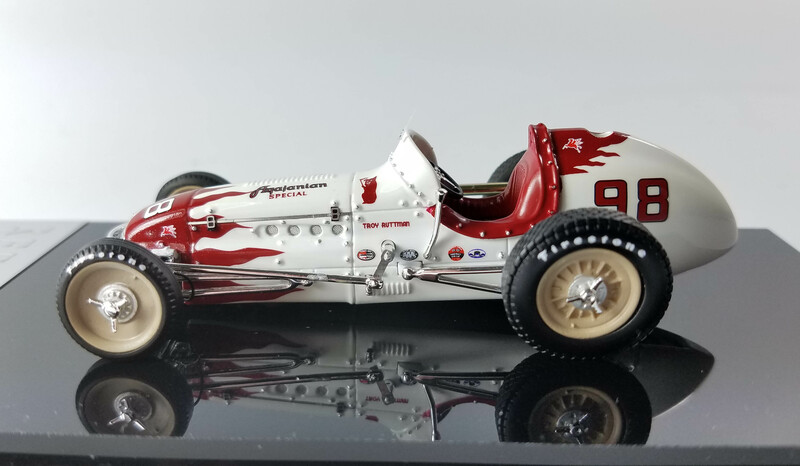 Now we’re the beneficiaries of Replicarz’s efforts to bring accurate replicas of these historic racers to Indy fans in 1:43 scale, a bit more affordable and shelf-friendly than the 1:18 scale models that Replicarz has built its reputation on for detailed home-grown diecast and resin models. These new models list at $89.95 each.